When you’re getting ready to move, the packing process requires significant attention to detail. 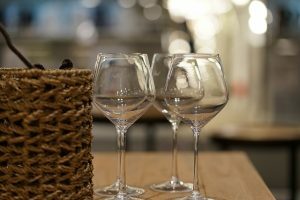 Moving to a new location can already be a stressful experience, so it’s important to avoid the headache of broken keepsakes, or shattered glassware, by packing things properly at the get-go and handling each item with care. 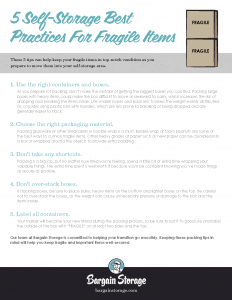 Keep your fragile items in pristine condition with these helpful tips. Know what type of packing material you need. Using the right packaging material is the first step to ensure your valuables are kept safe during transport and storage. Different items require different packing options to help keep them protected. For example, if you’re moving electronic equipment, you’ll need to use a different packing method and material than your glassware or fine china. Packaging peanuts: This material is used to fill empty spaces inside a box and take up the space between the item being protected and the sides of the box. They are used to withstand vibrations and shocks and will help level out the box to provide the protection your item needs. Bubble wrap or inflated wrapping: This is the classic way to cushion your valuables. Simply wrap the inflated material around your fragile items and secure with tape, then load into your box, making sure the weight is evenly distributed and the box isn’t too heavy. Furniture pads and padded inserts: Padded inserts can be used on glass, dishes, or ceramics. Furniture pads also ensure that the items stay in place. Paper: Many people use newspaper to wrap their glassware and valuables, but this isn’t always the best solution. Try using heavier grades of paper, or kraft paper (more elastic and difficult to tear), for wrapping items. Newspaper doesn’t offer this level of protection. Packing the items into your storage unit. Once your items are secured properly in their designated boxes or plastic containers, and you’ve safely transported them to your storage unit, it’s time to determine the best way to store the items. It’s often helpful to make an inventory of what the boxes contain, then write the contents on the outside of the container. This allows for easy accessibility and can help you more conveniently find the items you need later. Don’t forget to clearly label “fragile” on the boxes as well. If you plan on storing a lot of fragile items in your self-storage unit, consider adding some shelving units to the storage space for added support and convenient accessibility. This also ensures that you won’t over-stack the boxes, which could cause damage over time. When stacking boxes, always place bulky, heavy items on the bottom part of the floor or shelf, and the lighter items on top. If you have padded furniture to store, avoid putting heavy items on top. In addition, be sure you keep large, heavy items away from the entrance, so you don’t have to worry about continually moving the pieces when you go in and out of the unit. Taking a little extra time to make sure things are packed correctly will ensure that your moving and storage process is as stress-free as possible. Learn more about our Texas storage rentals in Dallas, Fort Worth, and Houston.